This one begins in early 1892 through the end of the day of August 5th, the day after the murders, in 1892. The “Key” to the sources remain the same as in the previous post. February 12, 1892 Former President Abraham Lincoln’s birthday is declared a national holiday in the United States. April, 1892 Borden barn is broken into. April 25, 1892 Bertha Borden is born. Daughter of Jerome C. Borden. April, 1892 Lizzie tells dressmaker Hannah Gifford that Abby is a “mean old thing”. May 4, 1892 Picker room fire in the Durfee Mill. May/June 1892 Andrew kills pigeons roosting in the barn. Morse visits end of June. July 11, 1892 Union laborers in Fall River celebrate new 58-hour workweek with giant parade. July 19, 1892 Lizzie’s 32nd Birthday. July 20, 1892 Lizzie supposedly sees a stranger at the back door when she returns from being out that evening. July 21, 1892 Lizzie & Emma leave Fall River; Lizzie stops at New Bedford to visit Carrie Poole & her mother; Emma stopping at Fairhaven to visit the Brownell’s. July 21, 1892 Lizzie travels on to New Bedford, staying with Mrs. Poole and her daughter at 20 Madison Street. July 25, 1892 Lizzie visits the girls at Marion at Dr. Handy’s cottage. July 26, 1892 Lizzie, Mrs. Poole & Mrs. Poole’s daughter ride to Westport to visit Mrs. Cyrus Tripp (Augusta, old schoolmate). July 26, 1892 Lizzie takes train from Westport to New Bedford to connect with Fall River. July 31, 1892 Bridget prepares first serving of the infamous mutton for Sunday supper. August 2, 1892 Andrews tells associate there is “trouble” in the Borden household. August 2, 1892 Swordfish is served for supper and served again warmed over for dinner. August 2, 1892 Andrew and Abby vomit during the night. 8:00 am Abby goes across street to Dr. Bowen; tells him she fears she’s been poisoned. 9:00 am approx Dr. Bowen crosses street to check on the Bordens; Lizzie dashes upstairs; Andrew rebuffs his unsolicited visit. 12:00 Noon Lizzie joins Andrew and Abby for the noontime meal in the dining room. 1:30 pm John Morse walks from train station & arrives at Borden house; Abby lets him in front door. 7:00 pm Lizzie visits Alice Russell in the early evening, states her fear “something will happen”. 9:00 pm Lizzie returns from Alice Russell’s, locks front door, and goes upstairs to her room without speaking to father or uncle. 9:15 pm Abby Borden retires to bed. 10:00 pm Andrew and Morse retire to bed. 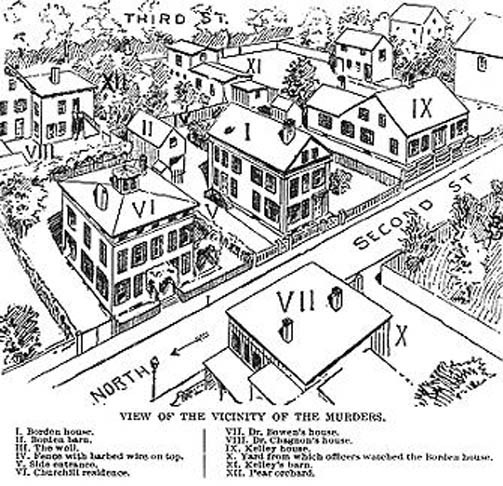 THE DAY OF THE MURDERS (Note: Times given are based on various testimonies taken primarily from the Preliminary Hearing held August 25-September 1st, 1892, and are approximated as close as possible). 6:15 am Bridget goes downstairs, gets coal and wood in cellar to start fire in kitchen stove, and takes in milk. 6:20 am Morse goes downstairs to stting rm. 6:40-6:50 am Andrew goes downstairs, empties slops, picks up pears, and goes to barn. 6:45 am Bridget opens side (back) door for the ice man. 7:00 am Bordens and Morse have breakfast in dining room. (Lizzie is still upstairs). 7:15 am Bridget sees Morse for first time at breakfast table. 7:30 am Bridget eats her breakfast, and then clears dishes. 7:45-8:45 Morse and Andrew talk in sitting room; Abby sits with them a short while before beginning to dust. 8:30 am Morse sees Abby go into the front hall. 8:45 am Andrew lets Morse out side door, invites him back for dinner. 8:45-9:00 am Andrew goes back upstairs and returns wearing collar and tie, goes to sitting room. 8:45-9:00 am Abby tells Bridget to wash windows, inside and out. 8:45-8:50 am Lizzie comes down and enters kitchen. 8:45-9:00 am Bridget goes outside to vomit. 8:45-9:00 am Andrew leaves the house. 8:45-9:00 am Bridget returns, does not see Lizzie, sees Abby dusting in dining room, does not see Andrew. 9:00 am Abby goes up to guest room. 9:00-9:30 am Bridget cleans away breakfast dishes in kitchen. 9:00-9:30 am Lizzie appears at back door as Bridget goes towards barn; Bridget tells Lizzie she need not lock door. 9:30 am Abraham G. Hart, Treasurer of Union Savings Bank, talks to Andrew at Bank. 9:45 am John P. Burrill, Cashier, talks to Andrew at National Union Bank. 9:30-10:20 am Bridget washes outside windows, stops to talk to “Kelly girl” at south side fence. 9:30-10:00 am Abby Borden dies from blows to the head with a sharp instrument. 10:20 am Bridget re-enters house from side door, commences to wash inside windows. 10:30-10:40 am Andrew Borden can’t get in side door, fumbles with key at front door, and let in by Bridget. 10:30-10:40 am Bridget hears Lizzie laugh on the stairs as she says “pshaw” fumbling with inside triple locks. 10:35-10:45 am Bridget sees Lizzie go into dining room and speak “low” to her father. 10:45-10:55 am Lizzie asks Bridget in kitchen if she’s going out, tells her of note to Abby & sale at Sargeant’s. 10:50-10:55 Mark Chase observes man with open buggy parked just beyond tree in front of Borden house. 10:55-11:00 am Andrew Borden dies from blows to the head with a sharp instrument. 11:00 am Bridget hears City Hall clock chime 11:00. 11:12-11:14 am John Cunningham sees Mrs. Churchill talking to others then uses phone at Gorman’s paint shop to call Police. 11:15 am Marshal Hilliard receives call from news dealer Cunningham about disturbance at Borden house. 11:15 am Marshal Hilliard orders Officer Allen to go to Borden house. (Allen notes exact time on office wall clock). 11:16-11:20 am John Cunningham checks outside cellar door in Borden back yard, finds it locked. 11:18-11:20 am Dr. Bowen sees Andrew, asks for sheet; alone with Lizzie for approx. one minute. 11:20 am Officer Allen arrives at Bordens, met at door by Dr. Bowen. Sees Lizzie sitting alone at kitchen table. 11:20-11:22 am Allen checks front door and notes it bolted from inside, checks closets in dining room and kitchen. 11:20 am Morse departs Daniel Emery’s on Weybosset Street, takes a streetcar back to the Borden’s. 11-22-11:23 am Officer Allen leaves house to return to station, Bowen goes out with him. Allen has Sawyer guard back door. 11:35-11:40 am Francis Wixon and Dr. Bowen check Andrew’s pockets and remove watch. 11:35-11:40 Officer Doherty questions Lizzie who tells him she heard a “scraping” noise. 11:35-11:45 am Morse arrives at Borden house, first going to back yard. 11:37 am Officer Mullaly arrives. 11:45 am Doherty returns; Officers Mullaly. Allen, Denny, and Medley arrive. 11:45 am Dr. Dolan arrives, sees bodies. 11:45 am Morse talks to Sawyer at side door, later testifies he heard of murders from Bridget. 11:45-11:50 am Morse sees Andrew’s body, then goes upstairs and sees Abby’s body. 11:50 am Morse speaks to Lizzie as she lays on lounge in dining room. 11:50 am Morse goes out to back yard and stays outside most of the afternoon. 12:15-12:20 am Officer Harrington arrives at the Borden house. 12:25 am Officer Harrington interviews Lizzie in her bedroom (she wears pink wrapper). 12:45 am Marshal Hillliard & Officers Doherty & Connors drive carriage to Andrew’s upper farm in Swansea. 2:00 pm Dr. Dedrick arrives at Borden house. 4:30 pm Stomachs of Andrew and Abby removed and sealed. 8:30 pm Mrs. Charles Holmes leaves the Borden girls and returns to her home on Pine. 8:45 pm Officer Joseph Hyde, observing from a northwest outside window, sees Lizzie & Alice go down cellar. 9:00 pm Officer Hyde observes Lizzie in basement alone. 8:30 am Morse goes to Post Office and sends letter “in haste” to Wm. A. Davis in South Dartmouth. 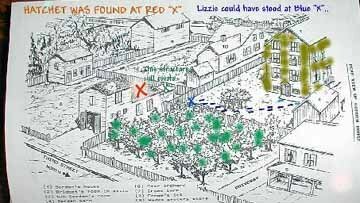 August 5, 1892 State Detective Seaver and Marshal Hilliard question Lizzie at her home. August 5, 1892 Evening Standard reports Emma & Lizzie notify newspapers of $5,000 reward for capture of assassin. August 5, 1892 Clothing from Andrew & Abby taken from washtub in cellar and buried in yard behind barn. August 5, 1892 John Morse goes to Post Office followed by a large crowd. 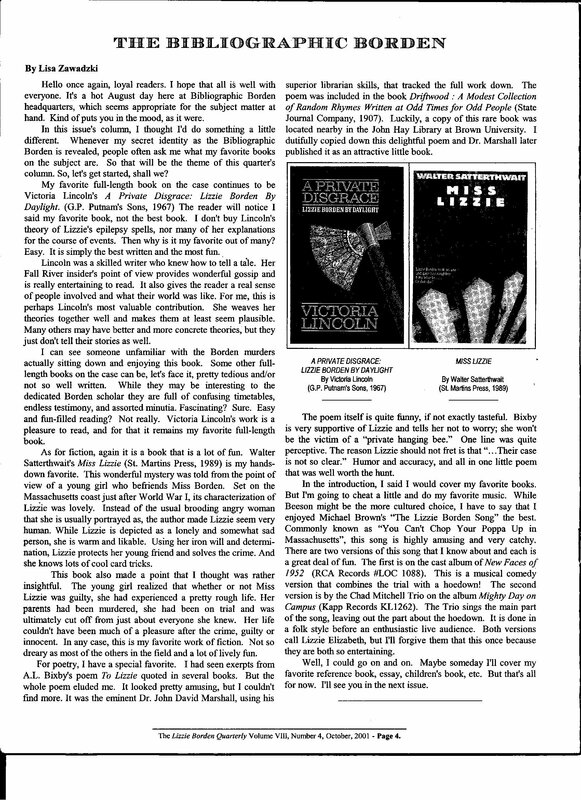 She forgot to mention Walter Satherwait’s Miss Lizzie, which was originally published in 1989 – 24 years ago, and shown here in a Kirkus Review. I’ve had this book (autographed) for years. It has recently been reprinted for Kindle. I’m surprised Ms. Koorey missed this as it appeared in the same issue of the that featured her research on the Preliminary Hearing. UPDATE: As I said, there will be many articles acknowledging the anniversary of these gruesome murders. Here is a sampling. Also news about the upcoming Lifetime Movie Channel presentation on the Trial starring Christina Ricci. From the Fall River Herald News is THIS and THIS. And this is the BEST. And also this from the FRHN. 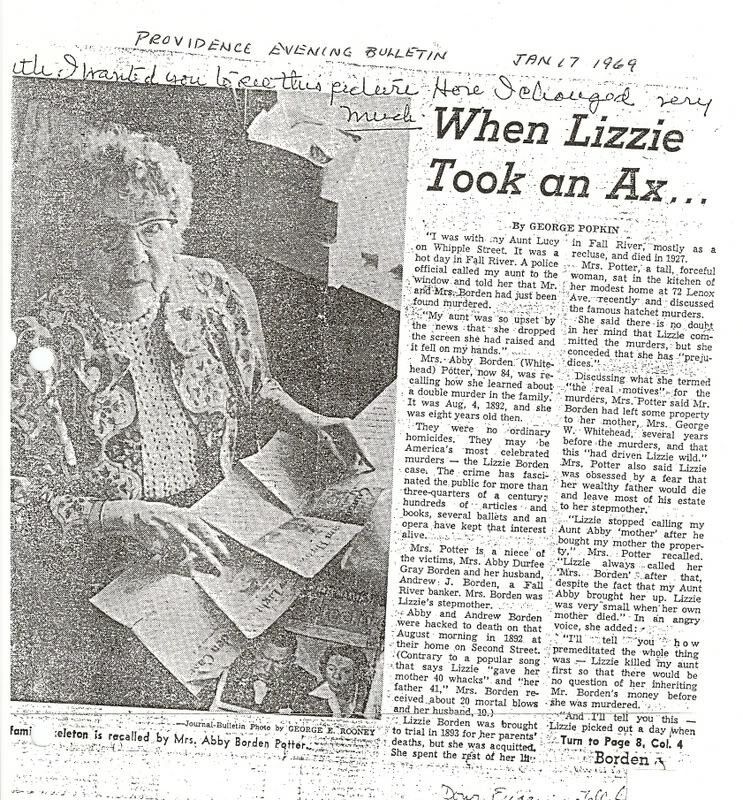 Debbie Alard Dion has for many, many years been the go-to local reporter for writing all things Lizzie Borden as the stories develop. This is her (pretty much stock) annual recap. Depending upon what happens Sunday, August 4th at US embassies overseas, it may or may not be a slow news day, relegating Ms. Borden to page 2 in some local papers. It’s almost that time of year when focus on Fall River, MA is dominated by Lizzie Borden and the unsolved hatchet murders of her father, Andrew, and her stepmother, Abby on August 4, 1892. A regurgitation of media mentions, short site and sound bytes, videos of the “murder house” (a Bed & Breakfast Museum since 1996) accompanied by eerie music and bloody graphics, and the gratuitous recitation of that inaccurate quatrain, “Lizzie Borden took an axe, gave her father……” (please, don’t make me go any further) will surely play out on various TV channels throughout the country. Also, it’s this time of year new books on Lizzie come out and this year it’s an attractively packaged fiction hardback by first time author, Michael Brimbau titled: The Girl With the Pansy Pin. Limited edition with color photographs (most all of which we’ve seen before) and its own slip case for a mere $85.00 (or the standard black and white paperback for $22). In my opinion, if you’re going to buy any book on Lizzie Borden – invest heavily right off the bat and get to know about the real Lizzie Borden and her Fall River. Buy THIS book: Parallel Lives. I’ve written about it myself several times HERE. Trust me. It should be your FIRST book if you haven’t read anything about her before. In the upcoming days, TV’s will be saturated with all the WRONG information about the “notorious” Lizzie Borden, depicted as a maniacal, axe wielding psychopath. And the masses buy into it because they don’t bother reading the facts that are available in a multitude of books, let alone free access to online primary source documents such as the police “witness” statements, Coroner’s Inquest, and Preliminary Hearing. In fact, the Preliminary Hearing is available at this blog site. So…. before you indulge yourself in the hash and rehash (pun intended) put down the bong and get a focus on what was going on in Lizzie’s Fall River and her life in general before, during and right after the crimes. Below is an extract from my “Lizzie Borden Historic Timeline” which is a comprehensive document focusing on local, U.S. and world events from1610 to 2010. Let’s take a look specifically at what was going on starting just two weeks before the murders. The windows of time that the killings could have taken place for first Abby, and then Andrew, are shown in RED. The Timeline was developed over a number of years involving comprehensive study and analysis of the primary source documents mentioned above. (The more expanded Timeline book cites the sources). Visualize the events at 92 Second Street in a different way – factual details that won’t be shown or reported on TV. 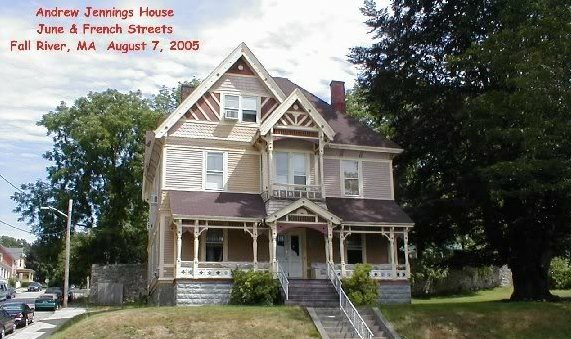 July 18, 1892 Emma and Lizzie deed back house on Ferry Street to Andrew and receive $2,500 each. July 20, 1892 Grover Cleveland passes thru FR enroute to NYC for Democratic Convention. July 21, 1892 Lizzie & Emma leave Fall River; Emma stopping at Fairhaven to visit the Brownell’s. July 23, 1892 Lizzie went on the street alone (New Bedford) to buy some dress goods gone from rooming house 30 minutes. 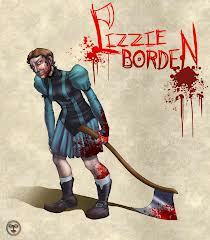 (Did she buy a new hatchet?). July 25, 1892 AJB writes letter to Morse telling him to wait about getting a man to run his farm in Swansea. July 25, 1892 FR Daily News reports on ladies (including Lizzie) vacationing in Marion. July 30, 1892 Fall River Board of Health reports 90 deaths due to extreme heat, 65 are children under age 5. 10:00-11:30 am Lizzie attempts to buy prussic acid from Eli Bence at Smith’s pharmacy on Columbia Street. 12:35 am Uncle John Vinnicum Morse leaves by train from New Bedford for Fall River. 2:00-4:00 pm John Morse and Andrew talk in Sitting Room; Lizzie hears their conversation. 4:00 pm John Morse hires horse and wagon at Kirby’s Stable and drives to Swansea in late afternoon. 7:00-8:00 pm John Morse visits Frederick Eddy at Borden farm in Swansea, brings back eggs. 8:45 pm Morse returns from Swansea, talks in sitting room with Andrew and Abby. 10:00 pm Andrew and Morse retire for the night. Morse sleeps in the guest room next to Lizzie’s room. (Note: Times given are based on various testimonies taken primarily from the Preliminary Hearing held August 25-September 1st, 1892, and are approximated as close as possible). 6:20 am Morse goes downstairs to Sitting Room. 8:45-9:00 am Morse leaves for Post Office and then to visit a niece and nephew at Daniel Emery’s, #4 Weybosset Street. 9:00 am Andrew leaves the house. 9:00 am Bridget returns, does not see Lizzie, sees Abby dusting in dining room, does not see Andrew. 9:00-10:00 am Abby Borden dies from blows to the head with a sharp instrument. 9:30 am Morse arrives at #4 Weybosset Street to visit his niece and nephew. 9:30 am Lizzie appears at back door as Bridget goes towards barn; Bridget tells Lizzie she need not lock door. 9:40 am Morse arrives at the Emery’s on Weybosset Street. 10:00-10:30 am Mrs. Churchill sees Bridget outside washing NE windows. 10:29 am Jonathan Clegg (fixed time by City Hall clock) stated Andrew left his shop heading home. 10:15-10:30 am Andrew stops to talk to Jonathan Clegg, picks up old lock; Southard Miller (at Whitehead’s Market) sees AJB turn onto Spring St; Mary Gallagher sees AJB at corner of South Main & Spring; Lizzie Gray sees AJB turning north on Second Street. 10:30-10:40 am Joseph Shortsleeves sees Andrew. 10:30-10:40 am Mrs. Kelly observes Andrew going to his front door. 10:45 am Mark Chase, residing over Wade’s store, sees man on Borden fence taking pears. August 4, 189210:55 am Bridget goes upstairs to her room to lay down. 10:55–10:58 am Bridget goes up to her room; lies down on her bed. 11:05-11:10 am Hyman Lubinsky drives his cart past the Borden house. 11:05-11:10 William Sullivan, clerk at Hudner’s Market notes Mrs. Churchill leaving the store. 11:10 am APPROX. Lizzie hollers to Bridget to come down, “Someone has killed father”. 11:10-11:12 am Lizzie sends Bridget to get Dr. Bowen. 11:10-11:13 am Bridget rushes back across the street from Bowen’s, tells Lizzie he’s not at home. 11:10-11:13 am Lizzie asks Bridget if she knows where Alice Russell lives and tells her to go get her. 11:10-11:13 am Bridget grabs her hat & shawl from kitchen entry way and rushes to Alice Russell’s. 11:10-11:14 am Mrs. Churchill goes to side door, speaks briefly to Lizzie, and then crosses street looking for a doctor. 11:16 – 11:20 am Mrs. Churchill returns from giving the alarm. 11:16 – 11:20 am Dr. Bowen pulls up in his carriage, met by his wife, rushes over to Borden’s. 11:23-11:33 am Dr. Bowen returns home, checks rail timetable, goes to telegram Emma, and stops at Baker’s Drug store. Telegram is time stamped at 11:32. 11:25 am Off. Patrick Doherty, at Bedford & Second, notes City Hall clock time enroute to Station. 11:23-11:30 am Lizzie asks to check for Mrs. Borden; Bridget & Mrs. Churchill go upstairs, discover body. 11:34 am Bridget fetches Doctor Bowen’s wife, Phoebe. 11:35 George Petty, former resident of 92 Second Street, enters the Borden house with Dr. Bowen. 11:40 am Bowen returns to Borden house. Churchill tells him they’ve discovered Abby upstairs. 11:35-11:40 am Officer Patrick Doherty & Deputy Sheriff Wixon arrive at house; see Manning sitting on steps, met at back door by Dr. Bowen, who lets them in. 11:35-11:40 am Officer Doherty views Abby’s body with Dr. Bowen pulls bed out to view her better. 11:39-11:40 am Officer Medley arrives at 92 Second Street. 11:44 am Doherty runs to Undertaker Gorman’s shop around corner and phones Marshal Hilliard. 11:45 Dr. Bowen shows Doherty Andrew, then Abby. Pulls bed out 3 feet. 11:50 am Morse speaks to Lizzie as she lays on lounge in dining room. Lizzie goes from dining room to her room and changes into a “pink wrapper”. 11:50 am –Noon Deputy Sheriff Wixon climbs back fence and talks to workmen sawing wood in Chagnon yard. 11:50-Noon Doherty, Fleet and Medley accompany Bridget to cellar where she shows them hatchet in box on shelf. 3:00-4:00 pm Crime scene photographs are taken of Andrew & Abby. 3:40 pm Emma leaves on New Bedford train for Weir Junction to return to Fall River. 5:00-5:30 pm State Detective George F. Seaver arrives from Taunton. 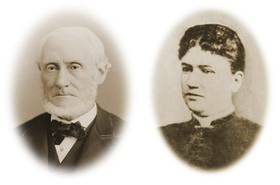 5:30 pm Dr. Dolan “delivers” bodies of Andrew and Abby to Undertaker James Winward. 5:35 pm Winward & assistant remove sofa from house and store it in a room at his building. 6:00 pm Alice leaves 92 Second St. to return home for supper. 8:30 pm Mrs. Charles Holmes leaves the Borden girls and returns to her home on Pine Street. 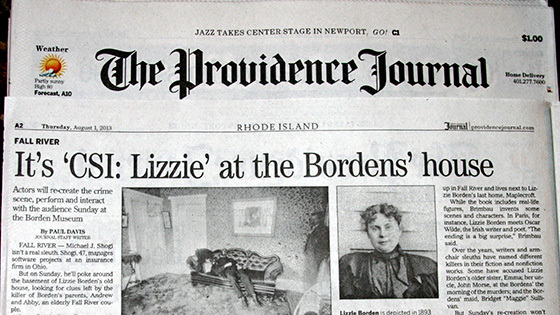 The Lizzie Borden Bed & Breakfast Museum – www.lizzie-borden.com – in Fall River, Ma. has been operating as Fall River’s most renowned tourist attraction for over 16 years. On its opening day, August 4, 1996, there even was a wedding held there for two overnight guests. 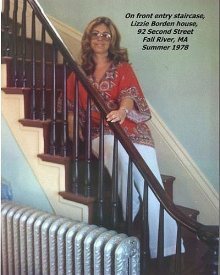 I was well acquainted with the original staff and co-owner, Martha McGinn, grand-daughter of John McGinn who graciously allowed me inside his private home in 1978 for a two hour private tour. It was he who introduced me to Martha. In those early years, overnight guests would sit up all night discussing the case and comparing scenarios of who-dunnit and how-dunnit. We would discuss all the books we had read, our theories on why she did or did not do it. We would express how eager we were for more photos of her and fresh information that would eventually surface from dusty trunks and boxes hidden away in attics and basements. In the past two decades, interest in the paranormal, and explosion of “Boo! Gotcha!” and “Is Anybody There?” reality shows, 92 Second has morphed into a Haunted House, and the accused though acquitted Lizzie Borden, into a maniacal, axe-wielding psychopath. These days guests sit up excitedly hoping for something to go bump in the night or, at the very least, an unidentified whisper followed by a cool chill up the spine. I don’t believe this house is haunted per se. I do think it’s “active”. I don’t think it’s creepy or scary. I think it is fascinating and comfortable and as a B&B, the best bang for your buck. It was in the beginning and it remains so thanks to an incredibly hardworking co-owner/Manager, Lee-ann Wilber and her staff. It occurred to me that so many of the very young visitors to the B&B are what I refer to as “first-borns of the digital age.” They were born at the onset of the paranormal resurgence. They exited the womb into a society dependent upon electronic gadgetry to communicate. Digital interaction via social networking became their playground as toddlers. Their thumbs controlled their input and output on some digital device more than turning the pages of a book. Their artistic expressions of Lizzie are reflective of false communications digitally obtained and transmitted. It reminds me of the old adage: “If you say it often enough, people will believe it.” These people will not, regrettably, read Parallel Lives – A Social History of Lizzie A. Borden and Her Fall River to really KNOW about Lizzie Borden. And that is very sad. Very sad indeed. The Lizzie Borden Bed & Breakfast is Fall River’s most renowned tourist attraction. Its market share of those visiting Fall River for the “sites”, far exceeds that of Battleship Cove or the Fall River Historical Society, particularly, and not surprisingly, those interested in the occult. While it has perhaps narrowed the draw for case purists, the B&B has widened its revenue base by targeting those that seek out digitally and in person the paranormal experience. And although it has no measurable input value, I’m fine with that. As I’ve stated many times, whatever keeps the place open is smart marketing. With regard to smart marketing, the B&B now offers up two types of tours: One with emphasis on the historical aspect of the case, and one with emphasis on the paranormal. I like that. I like that a lot. So now comes Halloween and fresh theatrics and surprises from the younger staff – some born on the cuspice of the digital age – you know, when cell phones were still the size of shoes. You can check this out at the B&B’s Facebook page or Dr. Bowen’s Facebook page (O.J. Sheridan). One can see new and fresh ideas coming forth that play upon the marketable interest in this unique Bed & Breakfast. Long time staffers, aging and fading into the background have given way to a more dynamic and modern pulse on the contemporary heartbeat. Note: You can click on “Categories” to the right for 92 Second Street and find my blog entry on the ownership history of the 92 Second Street. More outrageous claims on eBay regarding stuff that belonged to Lizzie Borden. This “Abbie” Potter WAS a niece of Abby Borden, but Lizzie didn’t leave her ANYTHING in her Will, let alone this chair. From my blog under the category of Urban Legends, is this post about Abby Whitehead Potter with a newspaper photo of her. This is the woman that the eBay seller asserts inherited that rocking chair from Lizzie Borden. Not likely. Here’s a chance to get a peek inside Andrew Jennings house; Jennings was on Lizzie Borden’s defense team at her Trial and had been a family attorney for many years. The video only shows the second floor where the bedrooms and study were in Jennings time. As with so many lovely Victorians in Fall River, this one has been renovated for apartments. But I always like looking inside them and do every time I visit Fall River and rentals are available. I love the hardwood floors, intricate woodwork, tile work and stained glass windows so common to these stately homes. I did a blog post a while back about Lizzie’s neighbors and who would have visited her, featuring this house. The house sits on the southeast corner of French and June, just a couple blocks down from “Maplecroft”. When I look up at the stone steps leading to the front door I usually think about Marshall Hilliard and Mayor Coughlin who, arriving by carriage after the Inquest, came to inform Jennings that Lizzie Borden was to be arrested.